Beautiful apple pie, Marina. I like the idea to add Grand Marnier (I never add it to apple desserts). Apples are such humble fruits but they make excellent desserts, don't they? Apples are staples in our winter kitchen, sweet and savory. I too find the addition of The Grand Marnier genius. Like the other commenters, I too like the addition of grand marnier, brilliant! Your apple pie is amazing and I bet it's so tasty!! My favorite pie filling is pumpkin, but also apple or cheese. I use Grand Marnier all the time in my baking. Your tart-pie looks so scrumptious. Very well decorated. Absolutely amazing! Dear Marina your 'everyday' pie looks good and sounds delicious! I love blogs that post about what they eat for dinner. I like Grand Marnier, I should try to combine it with apples too!! Heck, any pie is worth looking at! Your pie looks fine; and the top photo is nice. I really like the idea of cabbage and egg pie! Sounds wonderful. And the Grand Mariner in this pie is such a nice addition - great idea. Good stuff (as always) - thanks. John, thanks! I am still deciding if I want to take my photos into the "staged" level for the blog. I worked in media for so many years, that I am a little tiered of dressed up photos, etc. And I think it is not fair to the readers to have half way cooked chicken just for the look, or a scoop of lard instead of the good ice cream... Then photography is done for the art, that's another story. How many times I've read on other blogs comments of disappointment that their version of prepared food doesn't look the same way! Anyway, I have some ethical issues with that. You can never have too much light! Just put some tracing paper up over the windows - it'll cut down on the light, and soften it. Most commercial food photographers are using real food these days (they have to if they're being hired by a company that makes it). The big exception is ice cream (and again, if they're shooting for an ice cream company, they have to use the real stuff) because it melts so fast. I pay a lot of attention to the photos in my blog, but it's all real food (it's dinner!). The only exception is I sometimes use acrylic ice cubes in drink photos simply because they're so pretty - but the drink is the actual drink. Anyway, your photos are great and real! I do love a nip of booze with apples, and this pie looks delicious! Apple pie is my favorite. I think it's perfect! It's a lot of work doing the lattice on top but it sure gives it some nice texture. I love a Southern pecan pie best...made with just a few simple ingredients. I can't eat sugar any more though so I better not think about it! lol Sweet hugs! Thanks Diane. 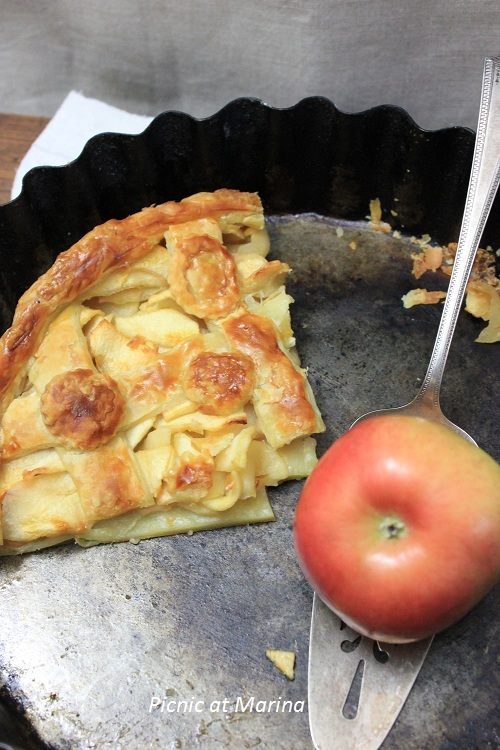 This pie can be baked without sugar at all, just use sweeter apples. A don't like to cover apples in too many spices, I prefer to taste apples in my pie. :) I don't remember if I tried pecan pie. Everything is so-so sweet, I need to find someone who bakes it and get a recipe from them. 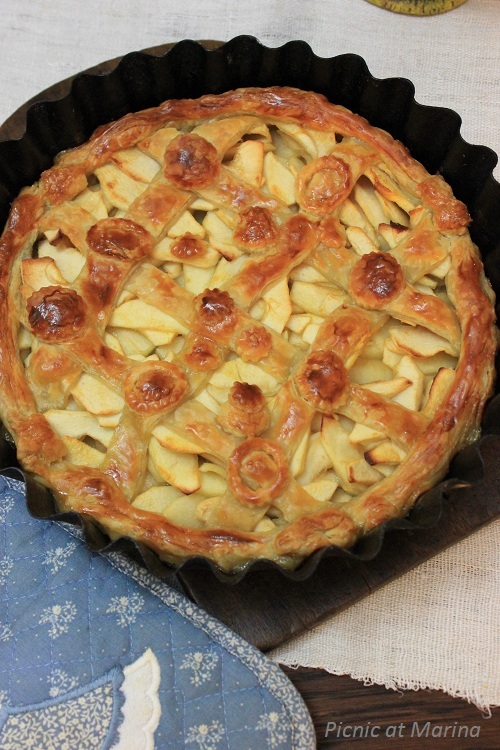 Wow, Grand Marnier and apples, that sounds like a real delicious pie! And the attice crust looks great! Wow, I want a piece of pie that big - it looks fantastic! I've never seen apple pie with anything in it but apples. This is a neat twist! Hi Marina. I have to say that any sort of chocolate pie is my first choice, followed by peach pie and then apple pie. My husband actually makes a mean apple pie. 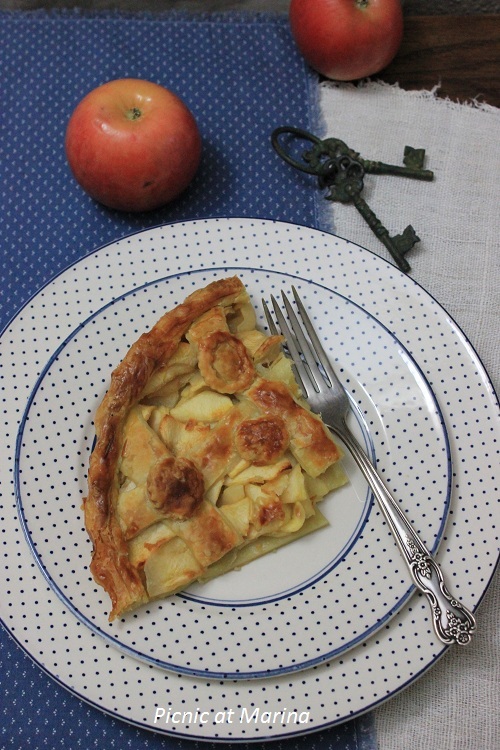 Your apple pie looks divine and I love the lattice crust you did on top. I use Grand Mariner in my tangerine bundt cake and you can't even taste it. I actually buy the mini bottle of Grand Mariner, (airplane size) whenever I bake with it. I love your last photo! There is no such thing as too much pie;) Love the flavours and use of Grand Marnier in your recipe. Marina, that's a gorgeous pie! And I think it's wonderful that you took the time to decorate it so beautifully for your family. Apple pie is one of our favorites at this time of year. Like you, I like my pies to follow the seasons. Marina You have got some beautiful photos.I especially like the keys to happiness and its true that there is no such thing as pie. I do not make them at home from scratch but its always a delightful thing to eat. Apple pie is pretty perfect but grand marnier would make it even more perfect! Oh I love apple pie too! And pumpkin. When I was a kid my favourite was apricot pie, but I haven't tried it in years. This post has definitely got me craving pie!!! I think I'm going to call you "the pie queen" Marina, I'm very impressed as pie is not my forte. Love this one with the Grand Marnier! Oh my! Marina, your apple pie looks fabulous! With Grand Marnier in the pie, I bet this pie disappeared instantly! ;) I miss out Thanksgiving this year and zero pie consumed. Now I wish I can have a piece of this gorgeous pie! Marina, first thing; I would like to thank you for your caring and kind words re: my upcoming eye surgery. Dear Elisabeth, I hope everything is going well with your eyes and surgery, and everything around it. Oh wow, this apple pie sounds heavenly. I love your addition of Grand Marnier. You can never have enough Apple Pie! :) Looks very delicious! This pie is amazing. I love your decorations and you did all this puff pastry, you are amazing. I like the addition of grand mariner and also the simple ingredient list make this one a key to happiness. Ha! As if a bottle of Grand Marnier would ever last long enough around here for me to bake with it! It's one of my secret addictions... that and Cointreau (actually I think I prefer Cointreau... do you know it?) - but it's definitely one of the reasons I don't buy it much. Great looking pie Marina - a real beaut', and the delicate orange flavour must be wonderful. I think I read somewhere that if you baked with alcohol that not only did the alcoholic content remain, but actually ended up being stronger after you'd finished cooking, but maybe that's only certain cooking methods, or maybe I mis-read it entirely. I remember being very surprised though because it seemed to be the complete opposite of what I would have thought would happen based on my (limited) scientific knowledge. Hi Charles, you are so funny, you make me giggle each comment! :) Yes, I do like Cointreau, I can't tell you though which one I like better... No, still Grand Marnier, but I'll have with you some Cointreau!